Principles of foot biomechanics and gait. The impact of aging and systemic diseases on foot and lower limb mechanics. Foot orthoses. Evolution of footwear design and purpose. Modern footwear. Footwear Assessment. Footwear Options. The relationship between footwear and the vulnerable foot. Managing patient engagement in orthoses and footwear as foot health intervention. Glossary. Appendix. Footwear and Foot Orthoses provides students and clinicians with a guide to the information they require to underpin their clinical decision making. Pocket Podiatry provides all the essential information for a modern Podiatric practice. Examination and diagnosis, aetiology, prognosis and management are provided in a practical and informative manner. 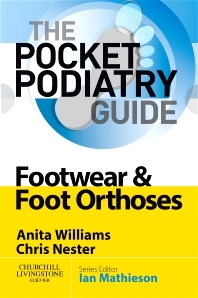 With its clarity and portability, students will find the Pocket Podiatry series an invaluable companion to their studies, whilst practitioners will appreciate its clinical orientation and concise format.